Because 2019 is well into my eleventh year posting this blog, I’ve decided to initiate a new monthly feature for this year: Gem of the Month. As a fellow art historian, I know all too well their inclination to pretend they know everything about every art movement and artist that ever happened (usually as a way of steering attention to themselves at an Art Department cocktail party). But that is humanly impossible. On a weekly, almost daily, basis I discover some hidden treasure of art history fact that seldom appears in “mainstream” art history. Thus, the purpose of this new series. Although you are probably familiar with dynasties in a variety of regions of the world, the idea of dynasty is not conjured up when studying Oceanic cultures. And yet, the islands of the South Pacific are so far-flung and numerous, it makes sense that there had to have been some. Case in point, the Saudeleur Dynasty of Micronesia, which flourished between the 1100s and 1600s CE. Migrants thought to have come from the area of Taiwan called Austronesians are believed by scholars to have settled Micronesia by about 1800 BCE. Micronesia—consisting of 2000 islands, coral atolls, and volcanic mountains—is 2,900,000 square miles (7,400,000 square kilometers) in size (wow!). The Federated States of Micronesia consists of 600 islands acroos one million square miles (2,590,000 square kilometers). Formerly the Eastern and Western Caroline Islands, it consists of four states: Pohnpei, Yap, Chuuk, and Kosrae. Pohnpei is the largest island. 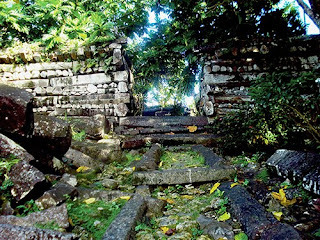 The Lapita, one of the many diverse cultures that made up the Austronesian migration, are thought to have populated Pohnpei from the Solomon Islands to the south. Pohnpeian tradition suggests that the Saudeleur dynasty began with the arrival of foreigners from a mythical island called Western Katau or Kanamwayso. Their intention was to build a religious center and established autocratic control over the entire island. 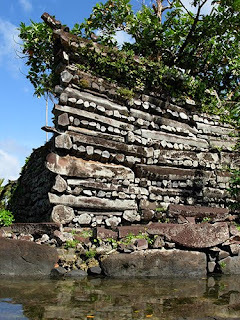 They built Nan Madol as a religious/political center. Nan Madol means “water between,” referring to the water channels between the basalt foundations of the ruins. The basalt was quarried on the western side of the island. 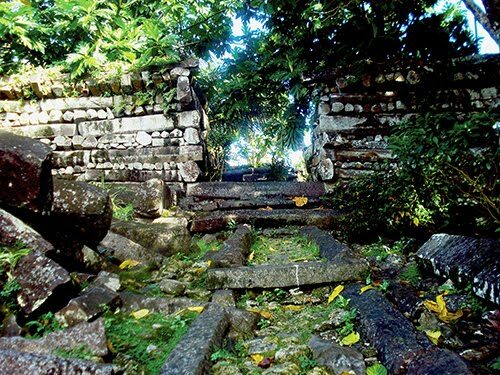 It is the only ancient city in the world built entirely on coral reefs, consisting of stone and coral-fill platforms on top of ninety-two artificially built up islands. The city encompassed palaces, temples, residences, and tombs. Although the culture did not have pulleys, horses, or metal, they built walls forty-nine feet (fifteen meters) high in some spots and as thick as sixteen feet (five meters). The columnar basalt pieces were laid in a header-and-pitcher pattern filled in with rubble (smashed coral). They are thought to have been raised with the help of palm tree trunks as levers. The walls were raised on platforms only three feet (ninety centimeters) above the water.